Home / Assorted / Amazon Prime Video | Get Paid For Watching Videos!!! We, at ThinkerViews always try to keep our readers informed about the latest offers which can help them getting quality stuff. Be it about Movies, TV Shows, Books, Magazines, Technical stuff or others. If you follow us on Twitter and FaceBook then you must have seen the book deals and other stuff we share with you. Amazon India brings in a lot of advantages to the prime members. Today let me share with you an interesting information I came across in the same regards. Amazon Prime Video brings in some of the popular movies and TV Shows for you. Its collection is impressive. And if you have smart TV you can watch it on TV also. And yes, you can watch it on mobile and computers too. Amazon also brings in Amazon Fire TV stick, a USB device, which you can connect with your TV and watch Amazon Prime Video there as well. Actually, I’ve not used Amazon Fire TV stick myself, so cannot comment more on that, but I’ve heard good reviews. Another option is using Alexa and Echo. Amazon is marketing Echo proactively and you might have seen it’s advertisement on TV as well. Actually, Amazon’s echo devices are speakers (or we can say, a streaming device) with pre-loaded Alexa, it is amazon’s answer to Siri by Apple. You can also see various cases appearing in the media where the data is found leaked from such smart devices and thus you can use with your consent. Here are a couple of quick links for you. Being a prime member we enjoy watching Amazon Prime Video on Computer and Mobile devices and we are quite happy with the performance. Their catalog is regularly updated but we really wish that it keeps updating with more speed and their library should be more enriched. Here are some of the movies and TV Shows we’ve reviewed which are available on Amazon prime video. I’ve watched some of them on Amazon Prime Video only :). But, why are we talking about this now? Well, I came across a fantastic offer, Amazon Prime Video brought in for the viewers, which I think is worth sharing with you. The offer’s terms and conditions are mentioned at the following link and I will recommend you to read it thoroughly. 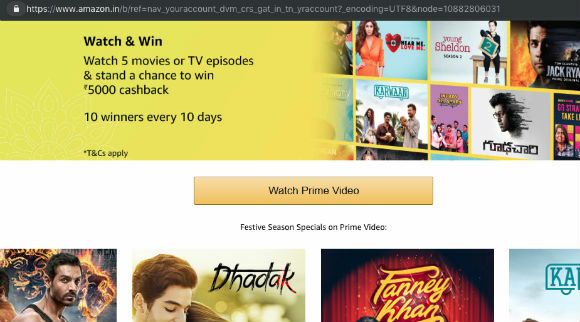 You need to watch 5 videos at Amazon Prime Video (be it a movie or a Tv Series episode) during each of the following periods and you will be eligible to become a winner for that period. Each period consists of 10 days. You need to be a verified Amazon Prime member and the verification process is mentioned on their terms and conditions page (linked above). The winner will get INR 5000! Amazon is definitely a trustable company and this offer is really interesting. If you love watching movies and TV Shows and if you are a verified prime member, this is something you don’t want to miss. The contest/program is over now and the “Winners” for all the periods are declared. Congratulations to all the winners :).